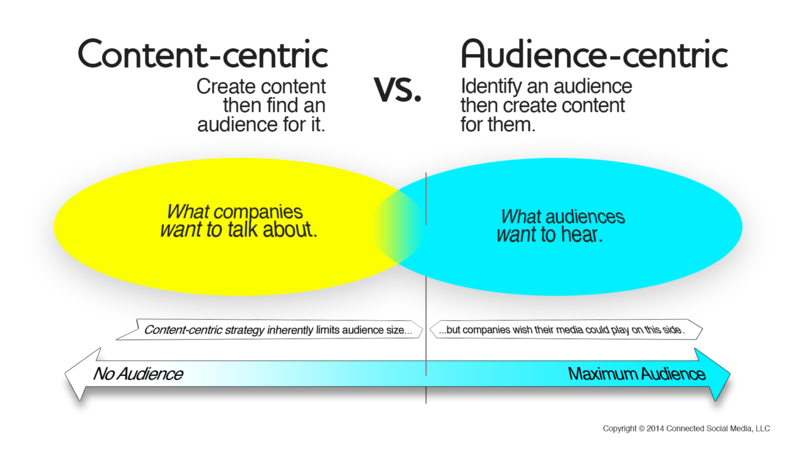 The most crucial content strategy decision a company will make is whether to be content-centric or audience-centric. It determines the size of your audience before you even open a mic or turn on a camera. Most companies adopt a content-centric model, which is to produce videos, audio shows, or what have you, and then seek an audience for it. No company purposefully tries to leave audience on the table. But the fine point is when a company talks about what it wants to talk about, audience size is inherently limited, generally to people who already embrace the messages. When a company finds out what people want, and talks about that, then the ship can leave the harbor to cast its net for a bigger audience. Companies study customer demographics, wants and needs, and employ this data to communicate the features and benefits of a product. These marketing messages aid and influence a buyer to purchase. But it’s a critical mistake to assume those messages are audience magnets and then fashion those messages into media content. Customer data serves as poor intelligence to understand how to attract viewers and listeners. The reasons a person decides to buy and why they are attracted to content are very different. Massive amounts of audience research, conducted since the 1960s, have shown that audiences are most highly motivated by stories and depictions of people; and far less by ideas and things. The rise of the Internet has handed marketers a practically free way to launch messages to the world. So, many content marketing budgets are miniscule. Content marketing is supposed to be cheap. Why spend on audience research and strategy? You make the media and then post it to see if anyone bites. If it only gets 200 views there’s always the next one. Unfortunately, this misses out on exploiting the time-value of media, which is significant. It’s like renting a home rather than owning. While the content-centric model is cheap, it results in a series of one-off posts and fails to leverage the value of video and audio content over time. With each new piece of media you’re basically starting over to attract an audience. However, in an audience-centric model the individual pieces of content are like Lego blocks which make up a whole greater than the sum of its parts. The media company strategy is to build a whole offering for an audience. It’s hard to recognize just how much distortion exists in our own tastes. It’s not a big deal in our personal lives, but in terms of business, no media company driving bottom line revenue can financially sustain the failure rate of content created on the basis of personal tastes and hunches. Successful media companies revere what audiences think. When a company favors the likes and dislikes of its marketers and executives over the audience’s, it risks creating an organizational acceptance of a lack of audience building which comes with a content-centric approach. The culture insulates itself from a professional practice of self testing and scrutiny because the company likes the media it produces even if the audience doesn’t. To put it in a series of unemotional factual statements, a media presentation, regardless of what it’s about, is a product. That product is composed of scripts, stories, transitions, editing, narration, personalities, intros, outros, music, etc. It will either be a good product or a bad product. The producers will either make that judgment based on their opinion, or on the opinion of the intended customers. If they consistently rely on their own opinion they will attract fewer customers. If they use their customers’ opinion they will get more customers.